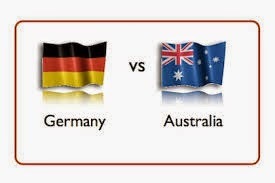 This is a friendly match between two very good offensive teams, the world champions, Germany will play against Australia tomorrow. Germany is way better team, and I think that they will easily win tomorrow. Germany is very good offensive team and they can score a lot of goals. Australia, one of the best offensive teams, they don't have very good defense and they are scoring a lot of goals. Previous matches of these teams are always ending up with a lot of goals.